One of the highlights of a visit to the Ganden Sumtseling Monastery is its roof, in the picture. The monastery is on the top of a hill outside the city of Shangri-La. You can get here by public bus or by taxi. You have to buy an entrance ticket to visit the place. 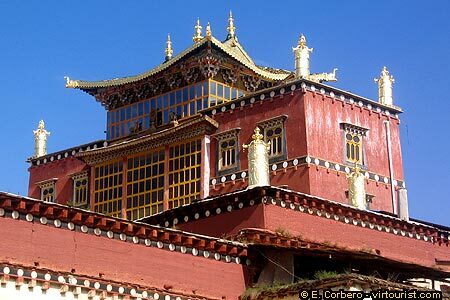 The monastery consists of two lamaseries, Zhacang and Jikang, several sub-lamaseries and numerous rooms for the monks. The entrance gate is at the foot of the hill. To get to the main buildings, you have to walk up 146 steps, a rather tiring exercise at an altitude of 3,300 meters!